The Partnership has produced a number of documents and publications, and are starting to compile relevant documents that have been published by others. These are broken down here by subject, and are also linked throughout the website in the relevant sections. This handbook has now been launched! It has chapters on wildlife, history, soils, nutrients, water, plant communities, management, restoration, and assessment and monitoring. It has case studies, real monitored examples, loads of really nice photos and simple tips on all things related to floodplain meadows. It has an entire chapter on the newly recognised sub-communities for MG4 and MG8 as well as some subsidiary communities found on floodplain meadows. 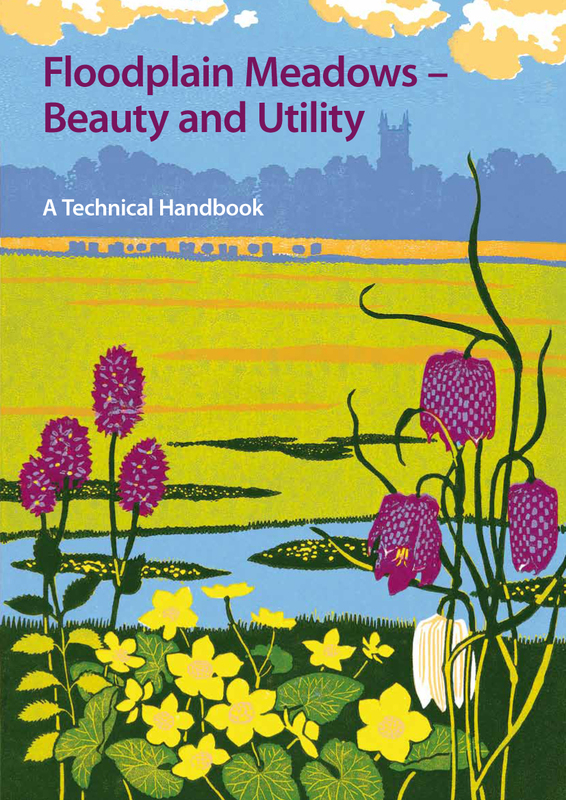 It has a Foreword by John Rodwell and a front cover by Robert Gillmor, and is a must-have book for anyone working with floodplain meadows. It will be distributed as hard copies to our partner organisations and will be available for download as a pdf from this page on our website. It is available to download here. This protocol describes the use of fixed point, repeatable 1x1m quadrats, how to locate them and then how to record species within them. It gives advice on number, location and distance apart. This protocol gives information on how to cheaply construct a dipwell in both permeable and less permeable soil, where they should be located and reading water levels within them. This soils key will help you to identify your soil type using simple in-the-hand techniques. The plant species list is a list of the typical species you would expect to find in an MG4 meadow. We use it for site recording and monitoring purposes. We have been working on an FSC foldout leaflet that will help with the identification of many meadow plants. As part of this we have developed a table that puts these plants in the context of their soil-water and fertility requirements. The data in the table are based on measurements of water-table depth from over twenty meadows. "Wet soil" refers to water tables that are so close to the surface that there is very little air in the soil. Plant roots need oxygen to live, and only a limited number of species can thrive in such conditions. "Dry soil" refers to water tables so deep that water cannot move up through the soil quickly enough to match the rate of evaporation and the top layer of soil dries out (Gowing et al., 2002). The table will show which species are tolerant of different soil moisture regimes. For example, sites that are subject to more than 20 weeks of wet soil and more than 20 weeks of dry soil per year support only a limited range of plants. In contrast, sites that are more moderate, with 10-20 weeks of wet soil and 10-20 weeks of dry soil per year will support a greater range of plants. These sites are where the typical floodplain meadow community is found. The table also shows the fertility tolerances of these species, with increasing fertility shown by the colour of the text grading from light green (low fertility) to black (high fertility). We have also indicated the likely NVC community found within each set of soil-moisture and fertility combinations. However please note this is indicative only. We are keen to develop case studies of management and restoration plans and projects on floodplain meadows from across the country. If you have a management issue and resolved it or you have tried a restoration project, then why not consider making it into a case study? Even if your project was not successful, this is useful information to share with others. We can do most of the work if you give us the information. Your project does not have to be finished to include it as a case study now, as we can update it as you go along. The more case studies we have of projects on floodplain meadows, the more success we should see across the country with restoration projects and management problems. Please see our case studies page for specific examples of restoration, management and monitoring from around the country. Some management guidance has been published on floodplain meadows. Additionally there are a number of research documents and scientific papers that have been published. It is not possible to reproduce all of these here, but the most relevant documents can be found by following the links below. The Ecohydrological Guidelines for Lowland Wetland Plant Communities collated information on the environmental requirements of various wetland plant communities including MG4 and MG8 grasslands. Some of the hydrological information produced resulted in models that indicate the optimal and sub-optimal water levels for each plant community. Similarly, tentative guidelines are given for tolerated nutrient levels. These guidelines are based on current available information, much from work in East Anglia. The Partnership hopes to update the information using a wider geographical base through development of the research work for MG4 and MG8 plant communities. Also the Environment Agency and Natural England are currently revising the guidelines to include some other wetland habitats such as dune slacks and wet heaths. The Water Regime Requirements and Response to Hydrological Change of Grassland Plant Communities (2002) was an appraisal of botanical data from 18 sites across England supporting species rich grassland. At each site between 60 and 800 botanical positions were surveyed (total 3904 sets of data). The water regime of each botanical position was modelled and validated against dipwell observations. Water regime was found to be one of the most important determinants of plant community composition and a range of water regimes for each community type was presented. Ranges of phosphorus regimes were also presented and the data suggested that phosphoros levels were critical in determining community composition, whilst other soil chemistry measures did not appear to be significant. Results are presented that summarise changes in plant communities following deliberate change in water regime. The work was commissioned to advise Defra policy with respect to Agri-Environment scheme design. This work was done under NERC Urgency funding last year in order to assess the impacts of the summer floods on floodplain hay meadows. This brief report summarises the findings, but does not go into great analytical detail. We hope to provide further analysis later in the year. Richard Jefferson and Claire Pinches (Natural England) have recently had a paper on floodplain meadows published in the journal Fritillary (Number 5). This paper summarises the current status of the MG4 community, threats, management and future conservation. It is a key document in understanding where we are with these species-rich habitats. It is available to view on the Fritillay website and by following the link below. This report aims to summarise existing knowledge, identify practical management guidelines and highlight deficiencies in our understanding of the ecology of Alopecurus pratensis-Sanguisorba officinalis (MG4) grassland. MG4 grassland, which is restricted to floodplain habitats, has undergone a severe decline during the last century. The conservation importance of this community is now recognised at a European level. Remaining stands of MG4 grassland are known to be sensitive to both site hydrology and nutrient availability and are therefore dependent on appropriate river management, both in terms of water quantity and water quality. This report is based on a review of relevant literature and the results of a questionnaire survey of conservation officers responsible for floodplain meadow sites. If water levels in Environmentally Sensitive Areas (ESAs) are to be managed effectively for nature conservation objectives, then quantitative information relating to the water-regime tolerances of vegetation is required. In order to provide this information, the relationship between species distribution and the long-term prevailing water regime needs to be understood with considerable precision. The information must also be in a form which is transferable between sites. To identify the water-regime tolerances of species, data were gathered from areas of species-rich lowland wet grassland throughout England. A total of 2,393 microsites were sampled, each consisting of a 1 m2 quadrat of grassland, and treated as independent observations. At each, the species complement was recorded and the water regime during the previous 10-20 years was modelled. For more information on the Partnership aims and objectives in a 2-sided downloadable pdf, please follow the link. To view our information leaflet on fritillaries, please follow the link. Fritillary leaflet.